It's not often I say this, but I'm quite please with how this card turned out. For once, it looks better than the idea in me 'ed! I certainly enjoyed the time I spent on it. Result! I've used Swings and Slides - Lil Kitty. Isn't she gorgeous? Monday morning of course, is Cupcake time. This week, our lovely Rachel has chosen Buttons and Bows. Cool huh? I think this is going to be popular! Our fabby Sponsor this week is Digi Doodle Shop and we're also joined by Polka Doodles and Scrap Affair for the month of October. Over at Pollycraft Monday, Cazza has also chosen a great Challenge. We'd like to see your creations for Girls. I think we're going to have a busy week over there too! We are lucky enough to be sponsored by Sew Sweet. Check out all the luuurverly stash that Emma stocks, there are ten different colours of Button Twine alone! You know how much I love string, right? Hey you, love everything about this one, the papers, the image, the twine and button, your fab colouring. Gorgeous card, no wonder you're chuffed. Brilliant card, that image is so cute, love the pink and red combo. The papers are so pretty too, just a great make! purrrrrrrfect card, I love it ! Gorgeous card Faye! I love that pink and red dress! Fab! Oh just way tooo beautiful Faye!! gorgeous colouring and love your doodling and lettering! Purr-fect! Love this one with that pretty patterned paper. So very cute. 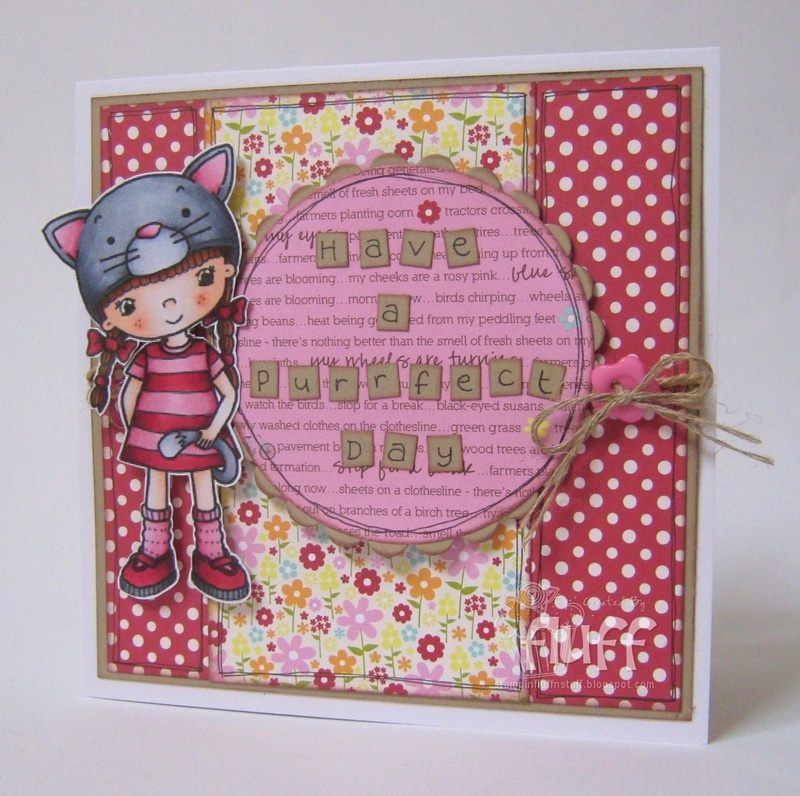 A purrfectly gorgeous card Faye, I like the image and the design. oooh this is a bit lovely my fluffy one. 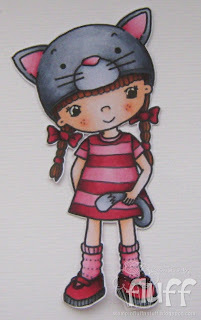 very much liking the kitten hat, can I get one for me? I think that's about the only sort of hat I'd wear in winter! This is gorgeous and I can see why you really like it - so do I! Love the way you made the sentiment too. May have to steal - um, I mean borrow that idea. Lovely Faye and I like how you put the sentiment in the center. You are so brilliant, guess that is why you chose me as a friend huh? Adorable, cute card Faye, sweet image and beautiful details. Seen it in the flesh so to speak! Adorable!! Love the image, dots & Pretty papers! The sentiment is purrfect too! (Guess that has already been said!! LOL! LOL...love the "beeeeeeeeep" what a hoot. Your card is AMAZING!! Love the bright and vibrant colors and that image is too too cute. :D Nicely done. Thank you SO much for playing along with us at The Squirrel & The Fox for our challenge. Such a cute card for a girl! Love the image and your coloring is great! Thanks for sharing it with us at Send a Smile 4 Kids and come back again! 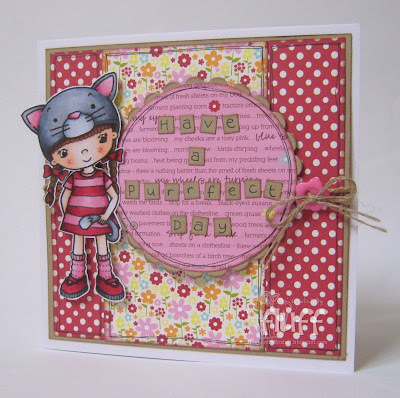 This is gorgeous Faye, your colouring is beautiful, love the layout and the fab details. A gorgeous card Fluff, the image and sentiment and great together. WOW!!! This is such a perfect card!! Love thesoft colours, the fun and quirky but cute image!! This is just so adorable!! Thank you for playing along with Send A Smile 4 Kids!! Great card! Love the image. Thanks for joining us at stamptacular sunday and I wish you luck on the challenge. Hope we see you soon again on SSC. Too cute - love the play on words! Thank you for playing with us at Paper Playtime...this card is so cute! I would love to learn how to color like you do...very nice job!